Sorry for the delay in posting her letters lately! I injured my hand and my computer usage is really limited because I can’t use my hand without heaps of pain. March 16 marks 6 months of our missionary serving. I feel just as shocked as she does. It is so hard to believe that the thing she has been preparing for her whole life is now a third of the way over. We were sent some pictures of her zone this week. 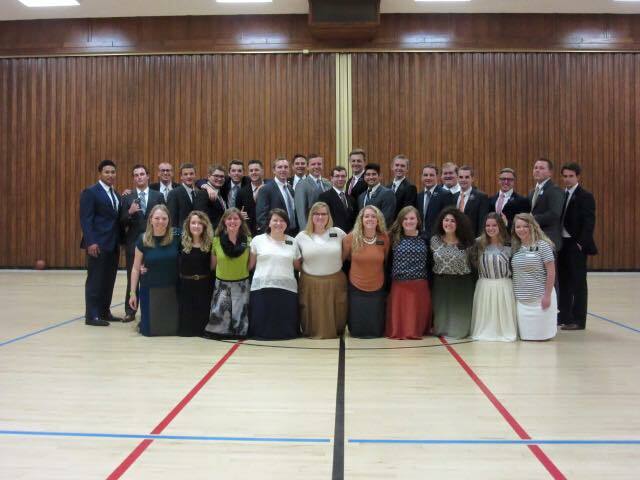 She is on the far right side and her companion is in the middle with the black skirt and curly blond hair. Those two have nearly identical hair! In one very short day I will be at my 1/3 mark. That is completely, totally and in all other ways inconceivable!!!!!!!!!!!!!!!! We have not yet been able to meet with Alberto and Andre, despite our best efforts. I’m beginning to see that us finding them together at home, at the same time, was a miracle in and of itself. They still really want to meet with us, but Alberto is traveling constantly and we’ve had a hard time keeping in contact. That has been one of the biggest struggles of this mission is that people are always busy, running around constantly. They are just too busy all the time. We would appreciate your prayers that we will be able to meet with them. We taught Glyna the Restoration lesson this last Friday. We brought a member with us who happened to know her daughter who passed away and they were able to connect really well. She’s been texting about how she feels really comfortable talking to us about everything especially the loss of her daughter. She really hasn’t had anyone to talk to about it, especially about God in all of this, and she says that it’s really helping her. Brother Chamberlin was able to help in the lesson so much. It changes everything to have a member there. The Spirit was really strong. We also had a lesson with a guy named Jo, who we met on campus. Most of the time people we contact there will set up a time to meet with us, then never show up, but he actually came! We had twin sisters there who just returned from their missions and it was amazing. We taught him the Restoration, too. We’re meeting with him again this week. It was a really powerful lesson and I really felt the Spirit. This week we taught Sydney about the power of the Priesthood. She just loved it! Part way through the lesson her eyes just got really big, and she was like “Whoa, this is so cool!” and we’re like “Yeah!” :) She thinks it’s so cool how a blessing is a message just for you from God. She is just so enthusiastic. It’s awesome!